How Far We’ve Come: Review – Dune II (DOS) | Continue? Ok, so Westwood’s Dune II isn’t technically the first strategy game that played in real-time, but it was the first game that we might today consider an RTS. It pioneered the interface and gameplay that is now standard in the genre. It was the first RTS to use the mouse to issue orders to units, and it featured the familiar mechanic of building a base, mining resources, and using those resources and buildings to train an army with which to assault the enemy base. This game really is historic and significant, and for its time it was pretty advanced. However, I thought it would be fun to review Dune II from a modern perspective and on its own merits – as if the game just came out today. Just how well has it aged? This game is based loosely off the 1984 film by David Lynch, not the Frank Herbert novel from 1965. If you’re a fan of the books, like me, you’ll no doubt find a lot to complain about already. If you don’t know anything about the story, the game won’t fill you in. While it is set in the Dune universe, it does not directly relate to any particular story, so seeing the movie or reading the book is not a pre-requisite to understanding what’s happening. There are three rich houses, and the Emperor of the Universe has decreed they fight for ownership of the desert planet of Arrakis. 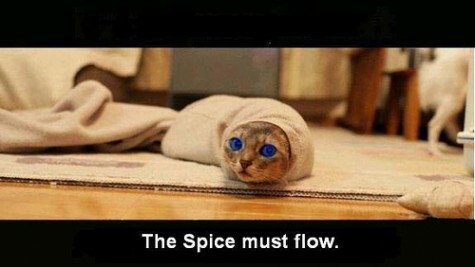 Arrakis is the only location of the spice Melange, a substance which extends life, improves health, and enables space navigators to chart safe passageways by looking into the future. Without the spice, interstellar space travel is impossible, and it can only be found on one planet. Arrakis is a harsh world of sand, storms, and the giant sandworms which inhabit the dunes and prey on trespassers. All this is impressively implemented into the game. After a well-animated introduction with full voice acting explaining this backstory, you’re thrown right into battle against the other two houses. The game world accurately reflects the desert and rocky outcroppings, and weather effects will damage your buildings over time. The military units consist of the regular tanks, faster trikes, and gun or rocket toting infantry, which would all seem a bit out of place in the book, but it’s a relatively small nitpick. If you’ve seen the movie, this will feel like a Dune game to you, and the story is sufficient to move the game along. 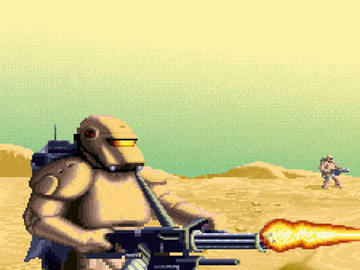 The graphics of Dune II are 2D, and include some decent sprite artwork. Great attention was payed to little details, such as a heavily damaged unit or building smoking and burning as it takes damage. It’s always very clear what everything is on the screen. I don’t have any complaints about the graphics, but they aren’t spectacular either. I’ll just save a little time and say this right here: this game is not fun. It’s unbelievably frustrating to actually play, because the interface is so limited. You can’t select more than one unit at a time. Read that again so you can let it sink in. You can only click on a single unit at a time! To give a move order to an army of 20 units (the maximum number you can build), you need to click on one unit, hit the M key, and click on a map location, and then you need to do that again TWENTY TIMES! You can’t drag a box around multiple units, you can’t hold shift and click multiple units to select them all, you can’t do anything but give one order to one unit at a time. Thankfully, the orders are hotkeyed for quick access, but you’ll need a quick and accurate mouse hand to issue those orders rapidly in battle. What’s more, the AI isn’t smart enough to attack an enemy while it has a move order, and there is no way to order a unit to attack-move. When you’re moving your army across the map and you need to engage the enemy army, you’ve got to order each unit to attack a specific enemy unit, too. Controlling this game is quite simply a chore. The control issues aside, the underlying gameplay isn’t actually terrible. It’s one of the slowest RTSes I’ve ever played, but the interface would make anything faster prohibitively difficult. Units move very slowly and take a very long time to die. The objective of every mission after the first couple revolve around destroying the enemy base(s), and assaulting a base will take a long time. In the early stages, units just take forever to destroy any single building, and the enemy can repair those buildings at least as fast as they take damage. Repairing takes credits, so eventually they will run low on money, but you’ll need patience. In the later levels, you’ll gain access to rocket tanks which demolish buildings much faster. 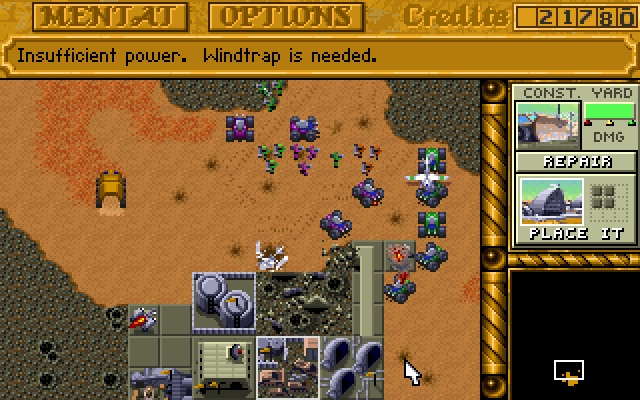 The game essentially demands the use of siege tanks and rocket tanks once that technology is unlocked, which exposes an annoying flaw in the design of Dune II: the units variety. Rocket tanks are useful for one major reason – they can attack over a very long range, with very high damage. They alone can attack turret defenses without being harmed, which makes them absolutely vital. They’re cannot hit any target at very close range, so they need a support unit, and that’s where the siege tanks come in. Without rocket tanks, assaulting the enemy base becomes almost unfair. Not only can buildings be repaired very quickly, they can be built directly on top of enemy units, instantly killing them. Defending is decidedly easier than attacking, and if the game were multiplayer I would consider this an issue. Thankfully, it merely presents a challenge for the singleplayer gamer. To help mitigate the difficulty of attacking, the enemy AI is impressively dumb. The opponent will send small groups of units at you, allowing you to destroy them easily as you mass up a force. If an enemy unit targets one of your tanks, you may pull the tank back, and the enemy will not find a closer target. It will merely follow your tank wherever it goes as you target the enemy with all your forces. The enemy will also not care that you are attacking his spice harvester over and over – he’ll keep sending it to the same spice patch whether you have tanks there or not. Some levels are quite easy if you can quickly find his spice harvester and park a tank next to it. Speaking of finding things, Dune II has a very unique exploration mechanic. The game features a fog of war, which obscures unexplored sections of the map. Unlike other RTSes, when a section of the map has been initially revealed, it will stay revealed. You can see every previously explored section of the map at all times, including enemy troop movements. Scouting out large sections of the map very early is important, but it only needs to be done once. There is a minimap which can be enabled by building a radar outpost, allowing you to view enemy troop positions all over the explored map at a glance. An optional minimap is an interesting idea not really seen elsewhere, but it’s just too convenient not to have. 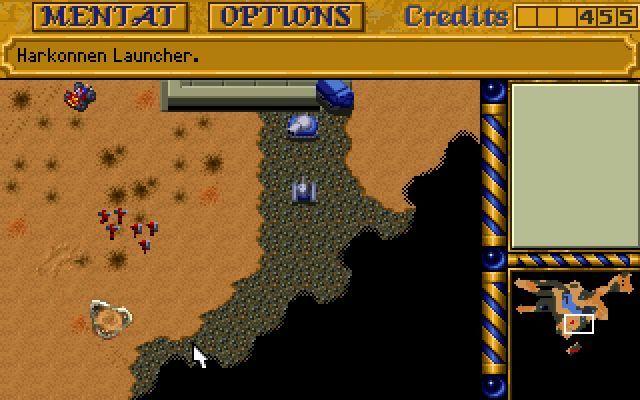 Dune II is slow, the strategy is simple, and the interface and controls are downright awful. Playing the game is a chore more than anything else. The best thing about this game is the soundtrack, which can be listened to without putting up with the game, if you know where to look. Even so, there are the makings of a good game underneath the annoyances. If the controls were fixed and the AI improved, the game might be closer to at least a competent RTS. What? Somebody did that? Oh, cool! An updated version of the game, featuring multiple unit selection and improved AI, can be found at Dune Legacy. This version requires the original game files to run, but it does offer marked improvements. It plays much closer to the Westwood sequel, Dune 2000, and both are well worth playing. 4/10: Pretty bad. Gets a few points for historical significance and being related to Dune. The original Dune II is playable via DosBox. The game is also available for the Sega Genesis. This entry was posted on Thursday, August 5th, 2010 at 8:14 pm and is filed under PC. You can follow any responses to this entry through the RSS 2.0 feed. You can leave a response, or trackback from your own site. I haven’t played this game in years. but it sounds like it didn’t age very well at all. I remember watching the game intro over and over cause I thought it was so amazing! It was one of the first games I played that had a voiceover. I’ll have to try out Dune Legacy. Great writing, yet again man. That’s really a blast from the past. I think the last DOS game I played was Star Trek.